This card really caught my eye! 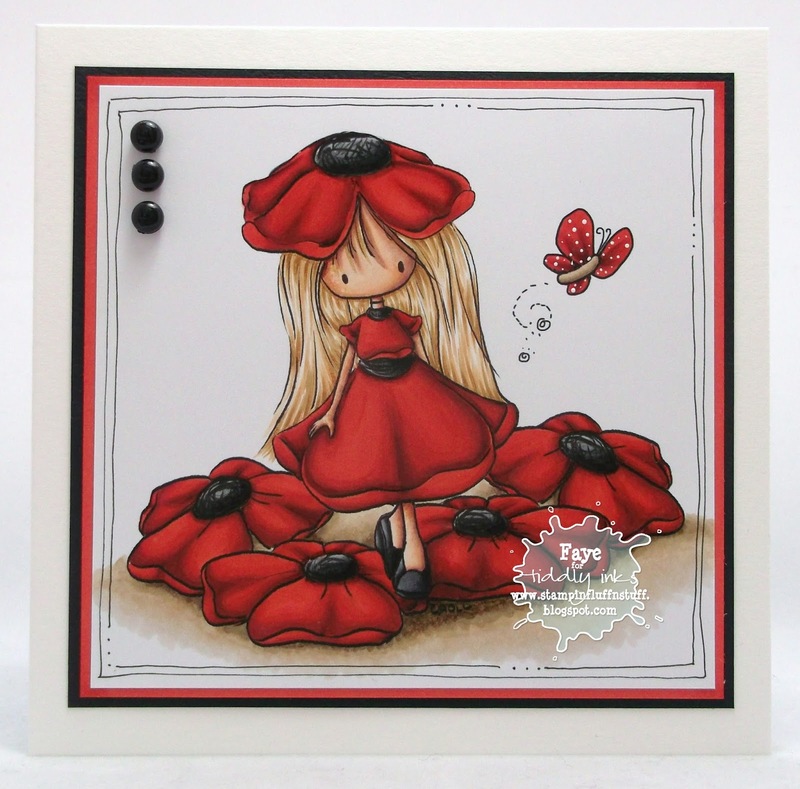 Such beautiful coloring and an adorable image, a fantastic design, Faye! Oh my word, how totally adorable is she?! Wow, you've been really bold with your reds and I just love this card! Really striking! LOVE LOVE LOVE this Fluff! Oh my .... FANTASTIC coloring ... wow!! WOW! Gorgeous coloring on a fabulous card! WOWZERS!!!! This is sooooo very Gorgeous!!!! Love it!! OMG .... she's sooooooo fabulous!!! Gorgeous card hon.... sorry I can't say more as I'm rushing off to buy her!! and now I'm back!! LOL! Just had to say what stupendous colouring... and particularly on the black of the poppy heads... how on earth did you get that look?? 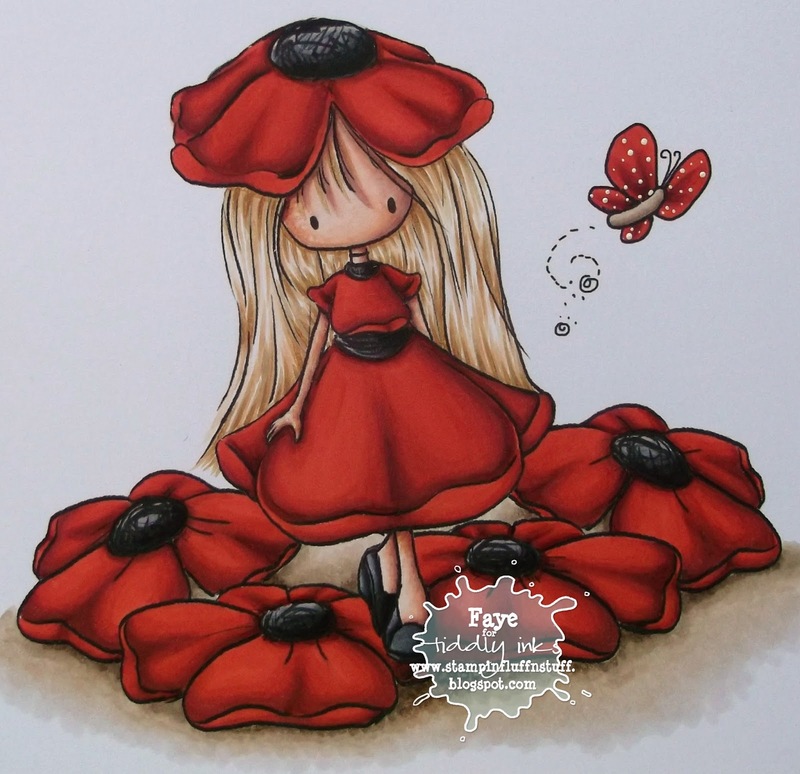 That is one stunning image Faye - I loooove those reds, so dramatic! And the blonde hair is wonderful, you should bottle your talent - you'd make a fortune selling it!!! PS - Thanks for the lovely comment you left on my All Dressed Up card, coming from someone with your talent it made my day! LOVE THIS! I just went and bought this stamp! This is gorgeous Faye, I like the design the image and the colours. I think red is the most difficult of colours to get depth with. You, my friend, have nailed it! OMG, this is sooooo fantastic; the colours, the super sweet design with the cute doodling, and of course the jaw-droppingly stunning colouring adds up to one amazing card. I know you warned me but I'm going to have to pop over to Tiddly Inks anyway...! I don't do cute but this is seriously cute!!! hugs Muver. I don't do cute but she is so cute I've gone and bought her!!!!! p.s. Don't show me any more.